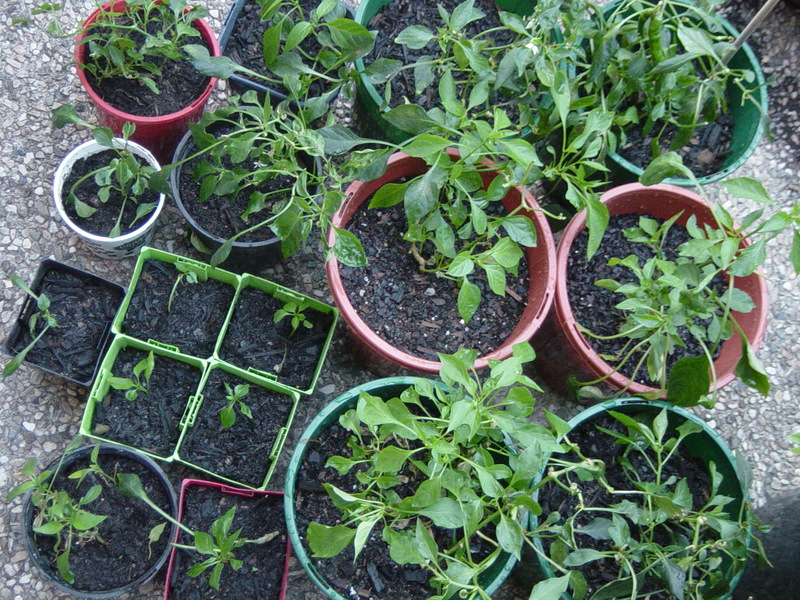 We are really enjoying growing fresh herbs in our garden, so far we've had the most success growing chillies. We have not yet realised the full potential of our potted garden, and are still in the process of exploring what we can successfully grow here and how we can make practical use of the produce we grow. 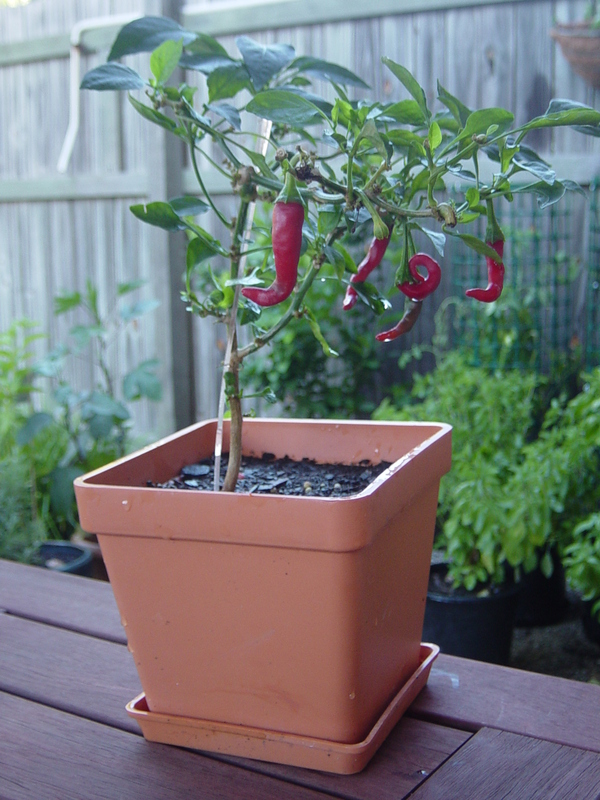 The chilli pictured was grown from seed we bought from BigW last year so I think this plant must be a year old. We have already harvested it once or twice, this might be the 3rd batch. Our first harvest was turned into what I called 'Chilli Toffee' as it was very sticky, although very nice to put on sandwiches. We removed the seeds to try and grow more plants. It was funny how David told me not to touch the seeds with bare skin but silly me, I didn't think it could hurt so I removed seeds with my bare fingers while Teena carefully removed the seeds by just using the tip of a knife. Well I suffered for not taking his advice for the next couple of hours, as the skin on my fingers tingled with a hot burning sensation! The second harvest made a very scrumptious tomato chilli relish, which was delicious on sandwiches and excellent when there were no fresh tomatoes left in the fridge. We want to make future batches with the tiny home grown tomatoes we occasionally get, probably supplimented with some more tomatoes from the shops. We need to relocate the recipe for this yummy relish so we can make more next time! All of our chilli seeds have germinated very easily, a lot easier than any other types of plants we've tried to grow from seeds. A couple of batches of chilli fruit have yielded more seeds which we collected and planted, not thinking so many would take. Now we have many chilli plants after only about 12 months! We have so many chilli plants, some should have festive-coloured fruit in time for next Christmas, which would make excellent gifts for those who like chillies and cooking. Even if they don't, they make quite a handsome plant for the garden. 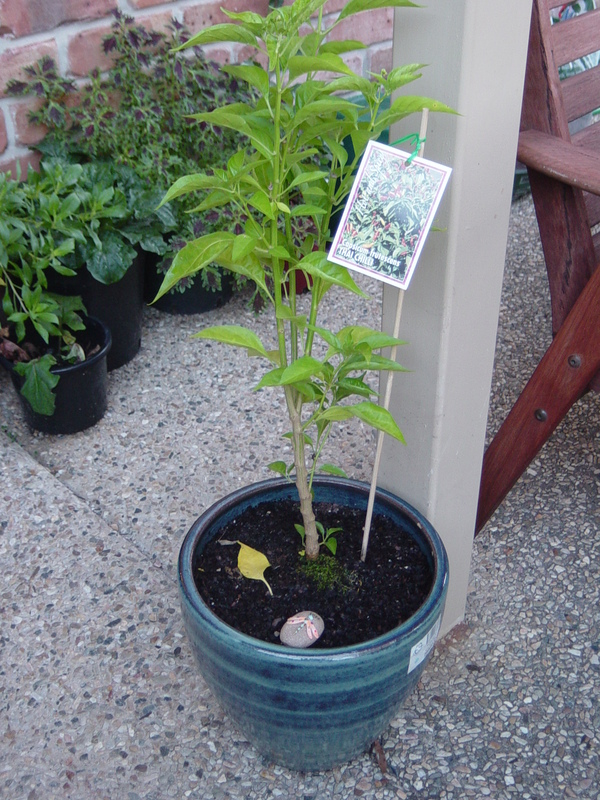 On a recent trip to check out a new nursery for us called Turner's Nursery we saw an excellent Thai Chilli plant which looked very happy and was full of bright fruit, so we bought our own to bring home in a pretty ceramic pot! 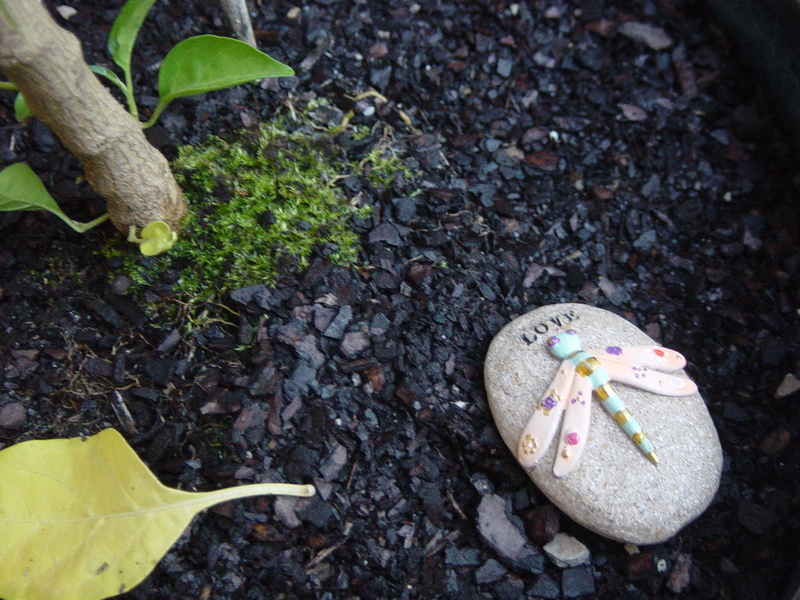 I put the dragonfly charm we bought there in the pot for goodluck!